Here is a kind endorsement from the only priest in Turkey within hundreds of miles of Antioch (Antakya). 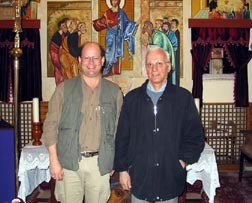 He is the priest of the small Catholic Church in the important New Testament city of Antioch, where we were first called Christians (Acts 11:26). I have received the DVD of "Apostolic Fathers" : thank you very much. It is very interesting. Waiting for you again in Antioch. I send you and your wife my best regards.